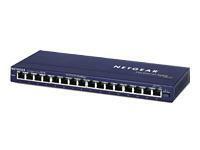 NETGEAR's FS100 series Fast Ethernet Switches provide your LAN with high-speed, 10/100 Mbps auto-sensing connectivity for as many as 5, 8, or 16 users. Just plug in your Ethernet cables, connect a power cord, and you're ready to go - there's no software to configure. Engineered without the need for internal fans, they operate silently. And each of these very compact switches is housed in a sturdy metal case for years of dependable use. When you want greater bandwidth and increased network access for your growing business, plus the added benefit of quiet operation, NETGEAR's FS105, FS108, and FS116 are your best choices for quality, convenience, and smooth-running usability - all at very affordable prices.